With political tensions heating up over the proposed Keystone XL oil pipeline and the Obama administration hinting it might delay its final decision on the pipeline until 2012 (officials previously indicated they would rule by the end of this year), the magnitude-5.6 Oklahoma earthquake on Saturday and the dozens of foreshocks and aftershocks felt throughout the weekend added a new wrinkle to the situation: the proposed pipeline route runs almost directly through the earthquake epicenter in central Oklahoma. 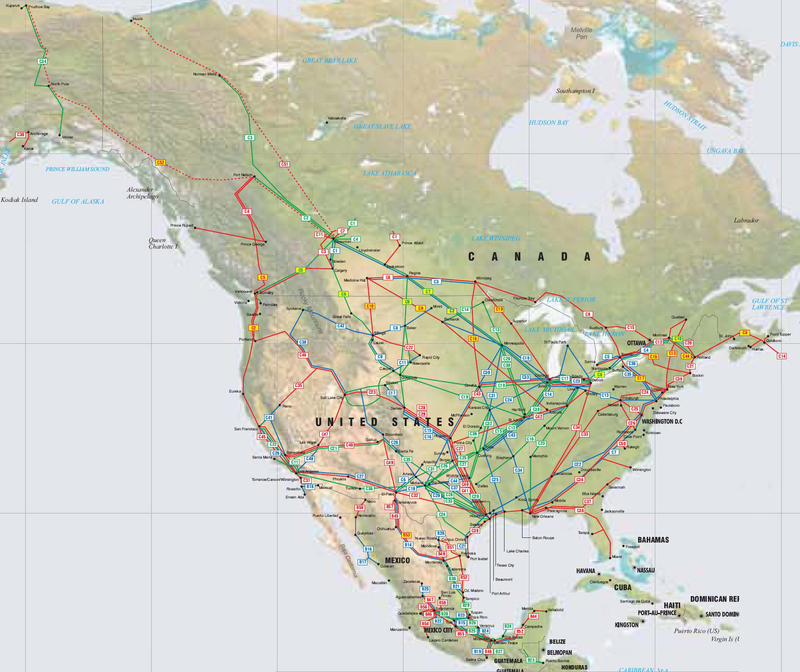 Oil and gas pipelines are nothing new to the United States, as can be gleaned from the complex maze of pipeline infrastructure evident in the maps below (click maps to expand). But the proposed Keystone XL pipeline isn’t any old pipeline. TransCanada’s $7 billion Keystone XL project would pump oil from the tar sands of Alberta, Canada, and bring it all the way south through the United States to refineries on Texas’ Gulf Coast. It’s not necessarily the distance of the pipeline that has most opponents up in arms, it’s the type of oil being transported. Production of oil from Canada’s vast tar sands emit greenhouse gasses at a rate three times that of conventional oil and gas production. And producing synthetic crude oil emits up to 20 percent more greenhouse gas emissions than low-sulfur, light crude oils. Biologists also say that increased tar sands development presents very serious danger for migratory birds. With those very concerns in mind, thousands of environmental activists descended on Washington, D.C. on Sunday, encircling the White House with a human chain in protest of the proposed pipeline. And it appears the action didn’t go unnoticed. In a decision that likely set off tremors of a different kind for pipeline supporters, the State Department announced on Monday it was launching an inquiry into the propriety of the review process after it was shown that the independent reviewer hired by the State Department to analyze the project was hand-picked by the pipeline developer, TransCanada. Editor’s Note: This story originally published Tuesday, November 8, 2011 at EcoPolitology.org. Timothy B. Hurst is the founding editor of ecopolitology and the executive editor of LiveOAK Media. Tim writes mostly about environmental politics, energy policy, green business and in the summer he has a nasty habit of covering the music industry. Before joining the team at LiveOAK, Tim was the founding editor at Green Options' environmental politics blog Red, Green and Blue and a regular contributor at sustainablog, CleanTechnica, Gas 2.0 and Celsias. Tim has a B.A. in International Relations from Lynchburg College and an M.A. in Political Science (Environmental Policy) from Colorado State University. When not reading, writing, thinking or talking about environmental politics and renewable energy to anyone who will listen, Tim spends his time skiing, hiking with his dog and getting dirty in his Colorado vegetable garden. Tim Hurst can be reached via email (tim at ecopolitology dot org), the contact form or by sending a reply to @ecopolitologist on twitter.